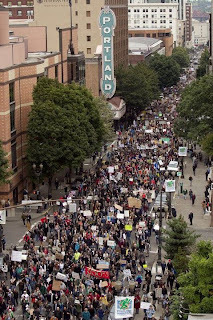 Yesterday AfD'ers were out for the opening Occupy Portland march, collecting signatures for Move to Amend, and spreading the word about Move to Amend Portland and local anti-corporate rule organizing in a march from Waterfront Park to Pioneer Square to Lownsdale Square. 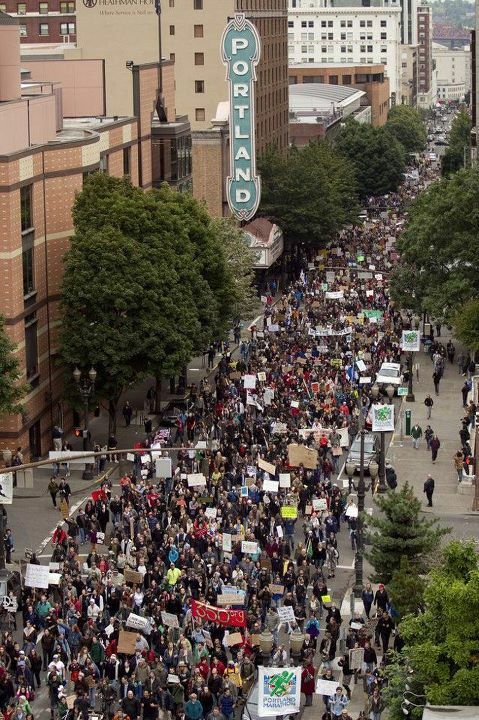 Portland chapter president David Delk reports more than 10,000 people in the streets. "It was awesome," he writes. "And just the beginning. The people have started to stir, and in the populist direction we all want." Here's a link to Shamus Cooke's story in the LA Progressive. Next week, on Thursday October 13, the chapter will sponsor a talk on "Communities of Color in Multnomah County: An Unsettling Profile," presented by Julia Meier, Coordinator, Coalition of Communities of Color. Ms. Meier will explore Portland's progressive reputation, and the reality behind the widespread assumption that it is an accepting community dedicated to economic, racial and ethnic equity. The Coalition of Communities of Color, in partnership with researchers at Portland State University, has spent the last two years documenting racial disparities. In May they released a comprehensive report on the status of racial disparities in Multnomah County across 27 different systems and institutions. Ms. Meier will present the findings and engage the Portland progressive community in dialogue. The talk will take place at the First Unitarian Church, Eliot Chapel, SW 12th and Salmon, from 7 to 9 p.m. Donations of $5 to 20 will be gratefully accepted, but no one will turned away. All are welcome. The Economic Justice Action Group of the First Unitarian Church is a cosponsor, with the Alliance's Portland chapter.